A self-folding straw has been manufactured that turnsfrom a flat strip toa cylinder on encountering water. Besides potentially producing a new line in just add water origami, the concept could be used for sampling liquids in potentially toxic environments. If we place a drop of water at one end, the material will curl into a tube, delivering the liquid up to 15 centimeters away, Wong said in a statement. The process is reversible using ethanol, and has the potential to lead to far more elaborate constructions. 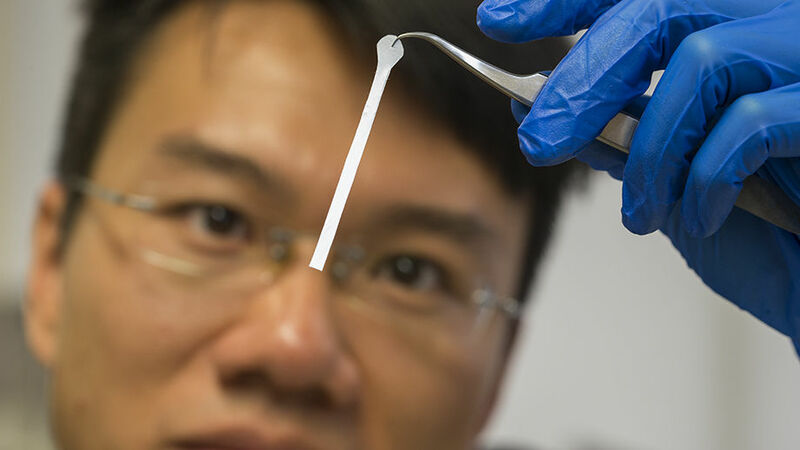 This enables a rapid self-assembly of complex shapes, such as bent, curved and splitting channels, that are a building block for micro-fluidic systems, Wong said. Previous self-folding materials, Wong told IFLScience, occurred on the millimeter scale. To go beyond the 15 centimeters (6 inches) Wong has achieved will be a challenge. We are limited by capillary length. You would need a specialized fluid with properties beyond what we have, he said. It might be possible in unusual circumstances, such as if you had a huge droplet in space. One for you, Commander Hadfield. Wong and his team have shown that water can be made to split at T-junctions and bend around curves. The potential complexity is almost limitless with laser cutters and craft cutters, he told IFLScience.